In honor of his new autobiography Earl The Pearl: My Story, I present the story below about Earl Monroe. This was a really fun one for me to dig out and read. I forgot how unusual it was and how many people I spoke to, including a passel of Basketball Hall of Famers, amongst them Earl’s college coach, Clarence “Big House” Gaines. man, I used to be really ambitious with these stories. Earl is speaking right here in Maplewood, at Words bookstore, this Saturday at 5 pm. I will be there. Slam has been on the trail of Earl “The Pearl” Monroe for years, so I couldn’t believe my luck when the man himself answered the phone at his New Jersey contracting and promotions business. True to the word of everyone who’s ever known him, Monroe was thoughtful, polite and articulate. He even seemed glad to hear from me, so his assertion that he didn’t want to talk about his glittering career because he was “ancient history” came as a shock. I assured him that he was wrong, and said that Hall of Famers line up to sing his praises. Indeed, Clyde Frazier says Pearl’s the only opponent he ever dreamed about stopping. Willis Reed calls him the only player he would stay home to watch on TV. Tiny Archibald says it was an honor just to be on the same court. Hard-driving CEO’s Dave DeBusschere and Dave Bing sound like awe-filled children as they recall Earl’s exploits. Still, Monroe doesn’t want to talk, thanking me for the attention and offering his blessing if we want to write a story without him. Recent health problems, he explains, leave him longing to look forward and not back. It’s hard to believe there is no room in Earl Monroe’s brain for basketball — like hearing Shakespeare say words no longer interest him. After all, the guy had so much shine that his street name was Jesus. What follows then are the words of his Apostles. Hopefully, it’s enough to make you – and him – understand why the people who knew his game the best were convinced that Earl Monroe was the Savior. Earl Monroe was a legend long before he ever set foot on an NBA floor, a playground deity in his hometown of Philadelphia, a black college messiah after leading Winston Salem State to a championship by averaging a remarkable 41.5 ppg in ‘67. And the points tell only a sliver of the story. His endless improvisations and bottomless bag of tricks led Monroe to be tagged with countless nicknames. He was Magic before Magic and Doctor before the Doc, to name a few. Monroe was a late bloomer, favoring soccer and baseball as a kid. He didn’t hit the hardwood until he was 14 and didn’t make the varsity team at John Bartram High until midway through his junior year. After graduating, he enrolled at Temple Prep to improve his chances of getting a scholarship offer, but dropped out after a semester and worked as a shipping clerk. All the while, Monroe’s playground legend was growing. Though he played center in high school, on the blacktop the 6-3 Monroe was already a whirling dervish of improvisational moves. His growing street rep filtered all the way down to North Carolina, where Winston-Salem coach Clarence “Big House” Gaines offered Monroe a spot on his team sight unseen. Winston-Salem played in the CIAA league of black colleges, which was filled with top shelf talent as D1 schools were only beginning to fully integrate. The league featured an uptempo game which was rare elsewhere and which allowed Monroe to be himself. He averaged just 7.1 ppg as a freshman, but 23.2 ppg as a sophomore and 29.8 ppg the following year before blowing up as a senior for 41.5. Meanwhile, he continued to return to Philadelphia each summer, growing his legend in the city’s competitive Baker League. Tiny Archibald, another playground hero who became an NBA Hall of Famer, recalls people literally bowing down when Monroe walked onto the court for games pitting the Baker League All Stars against New York’s Rucker League All Stars. Despite all his success, Monroe was considered an uncertain pro prospect. Baltimore and Detroit flipped a coin for the right to pick first and grab Providence’s Jimmy Walker. Detroit won the battle, but lost the war, though the Bullets hesitated long and hard before selecting Monroe at the urging of a young scout by the name of Jerry Krause. Two months into the season, Monroe was in full control of the Bullets, and was named ROY after averaging 24.3 ppg, tied with Wilt for third in the league. But, again, the points only tell a fraction of the story. Every guard in the league dreaded facing Pearl because his improvisational moves made it impossible to play anticipation D. Bing laughs when told that Frazier dreamed about defending Monroe. Monroe’s assortment of moves and brilliant, endless knowledge of the game became ever more important as his knees, already bad as a rookie, grew worse over the years. Despite commanding such reverence from his peers, Monroe was, as Frazier notes, “extremely misunderstood.” He was viewed as a flashy individualist despite teaming with Wes Unseld to transform the Bullets from doormats to serious contenders. After losing to the champion Knicks in a great 7-game Eastern Finals in ‘70 they made the Finals the next season, losing to the Bucks of Kareem Abdul Jabbar and Oscar Robertson. Monroe also remained a fixture in the Baker and other summer leagues, giving him a profound connection to the black community, even while some pundits wrote him off as a sideshow attraction. When he was traded to the Knicks midway through the 71-72 season, critics clucked that Pearl would never meld with Clyde or fit into Red Holzman’s team-oriented system. While his game was still intact, Pearl quietly took a backseat on the Knicks. After averaging 24 ppg in his four full seasons with the Bullets, Monroe initially served as sixth man in New York before teaming with Frazier in one of the greatest backcourts in league history. While still electrifying, Pearl gave up countless shots, averaging just 11.9 and 15.5 ppg in his first two season with the Knicks, a sacrifice which did not seem to bother him in the least. Having already accomplished so much individually, Monroe only wanted one thing when he arrived in New York: a ring. He got it in his second season there, clinching the ’73 title by scoring eight points in the last two minutes of the deciding game to drop the Lakers in five. Their second title in four years was a virtual last gasp for the Knicks. After one more elite season, Reed and DeBusschere were gone, Bill Bradley was barely hanging on — and Monroe again became a leading man. 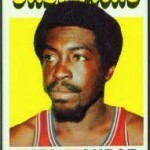 Monroe upped his scoring back over 20 ppg from ‘75-’77, while also increasing his boards and assists. He had two more solid years in ‘78 and ‘79 before finally slowing down in his final year, ‘79-80, playing just 51 games and scoring just 7.4 ppg. It was a remarkable 13-year career for a guy who played with knees so bad that a ’68 Sports Illustrated profile questioned his ability to play more than a handful of NBA seasons.